Taking a break from the constant news of war and political chaos in the Middle East, a new find occurred while engineers for the Beit Shemesh Water Corporation were completing a new water line for Jerusalem. You’ll find this interesting. The company hit the jackpot! One of the enduring contributions of the Roman Era was the construction of highways crisis-crossing the empire. Before the Romans became the dominant military force in the then known world, most countries were covered only by trails that were improvised at best. Moreover, these winding roads were often beset by raiders and thieves. So, when Joseph took Mary to Bethlehem, the trip was no easy matter. Upgrading trails into highways allowed the Roman Armies to maintain control of the many countries and areas they dominated. Their forces could move quickly and efficiently. Consequently, they maintained a system of travel that allowed the army to strike quickly. Moreover, the roads also allowed for transportation of the main stables of the citizens, such as wine, oil, and grains. This highway system united people in a new and effective manner. Such was the case with the “Emperors Road” which connected Beit Gurvin (then Eleutheropolis) and Jerusalem. [We’re coming to the new water line construction]. The Emperor Hadrian (Around 130 CE) had misled the Jews which created the Bar Kochba revolt that killed many Jews and large numbers of Roman soldiers. The Emperors Road highway was completed during this struggle. Today that route is Highway 375. During work on the new waterline, ancient pavement stones were uncovered. In the cracks between these slabs were uncovered ancient coins as well as a milestone bearing the name of Hadrian. 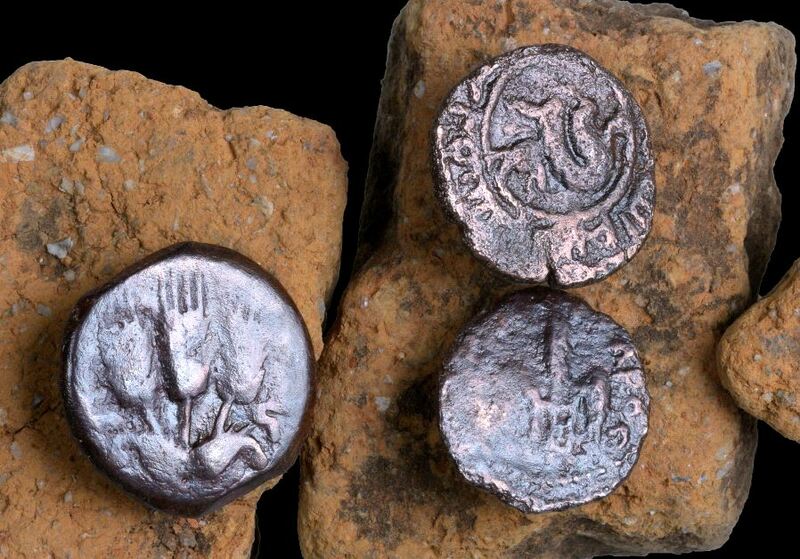 One of the coins was from the period when Pontius Pilate was perfect of Judea. Another coin was minted around 41 CE when Agrippa I was king. These coins bear witness to the facts of history and one of the most contentious times in what today we call ancient history. Hard to believe those coins are 2,000 years old!